Preheat oven to 200°C. With the tip of a sharp knife, make deep thin slits all over the lamb meat, and then insert slivers of garlic into each incision. Season lamb all over with salt and pepper and place in a large oven pan. Roast lamb for 30 minutes. At the same time, heat oil in a saucepan, add onion and cook over a medium heat for 10 minutes to soften but not brown. Add chopped tomatoes and 1/2 cup water and simmer for five minutes. Add olives and rosemary and season with salt and pepper to taste. Reduce oven temperature to 180°C. 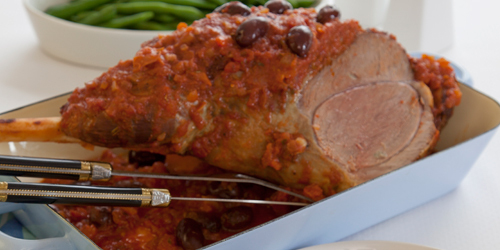 Pour hot tomato sauce over lamb and continue roasting for one hour, basting occasionally with tomato sauce. Remove lamb from the oven, cover with a tent of foil and rest for 10 minutes, so that the juices set. Slice to serve with a green vegetable, such as steamed beans, on the side.